Don’t know if you’re still on here, but we had a case like this the other night. Thanks for the insight. One of our docs diagnosed it from the X-rays and she was right. Thank you so much for kindly sharing your story; this is exactly an alert to the readers of this site. When I see a patient with history of vomiting and the physical exam reveals a disteded abdomen I routinely order plain abdominal films (x rays) among other things. The work-up is crucial in this condition. I found this page while looking for information on gallstone ileus. I’m 64 and had laparoscopic surgery three weeks ago to remove the obstruction, a largish gallstone “lodged where the small intestine joins the colon” (my dorctor’s explanation) The gallbladder was not removed or the fistula fixed because the area was still inflammed, and I was acutely debilitated and dehydrated after four days of constant vomiting. I’m recovering quite well, able to eat normally etc. and feel generally good. I will go for a follow-up check in a couple of days and at that point, the doctor may (or not) contemplate further surgery to remove the gallbladder. We’ll see. Mainly I wanted to alert your readers to one curious fact. During the four days of miserable and constant vomiting, I went twice to my local Urgent Care clinic. The doctors who saw me thought I was suffering from either food poisoning or a 24-hour stomach flu, and did not suspect anything worse because I HAD NO PAIN AT ALL. They gave me one liter of saline intravenously each time and sent me home with prescriptions for anti-nausea and anti-acid reflux medicines. On the fourth day, my dehydration was so acute my kidneys shut down and my blood pressure plummetted, I lost consciousness and was admitted via ambulance to the hospital. There, after two days of resuscitation and tests, the obstruction was diagnosed and surgery performed. The surgeon was also puzzled at the LACK OF PAIN, but there you have it…it happens. So, because I felt no pain anywhere, the doctors at the Urgent Care facility did not recognize the possibility of a gallstone obstruction. Please alert your readers to the fact that absence of pain does not necessarily rule out something as serious as gallstone ileus, and that uncontrollable vomiting calls for prompt attention…at a hospital! I wasted four days! You don’t provide us any information of what part of the intestine was removed. But any type of intestine resection may lead to intestinal obstruction (stenosis). My mother had a surgery a week ago, she had acute gallstone. It had a complications in her small intestines that the surgeons cut part of her small intestines because of the presence of stones, they mention that the her case was severe and they don’t promise anything. A week into the surgery she started vomiting after she was given water and light meal. She vomits a lot of smelly blood and everything that she had taken in. Three consecutive x-rays were done and the doctors said that she needs another surgery because it looks like that the intestines stuck together causing obstrution of whatever she takes in. Can I get your opinion in this case. Thank you for your feedback Linda, stay connected. 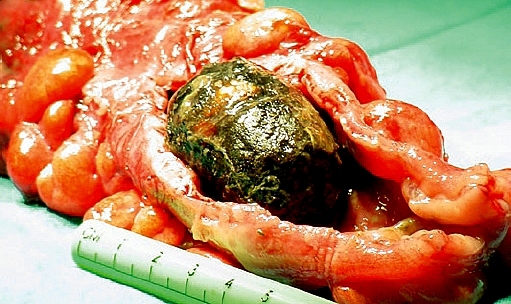 Gallstone ileus is a complication of biliary enteric fistula (wich complicates 2% to 3% of all cases of cholelitiasis). So it takes a long to have this condition. Once patients have a gallstone in their bowel, the mean symptom duration before hospital admission is approximately 5 days. Regarding to its size, 90% of obstructing gallstones are greater than 2 cm in diameter, with the majority measuring over 2.5 cm. Thanks for visiting. I’ll be waiting for the next edition of the Nursing Blog Carnival you are going to host on next week. I’m not on blogtastic. Unbounded Medicine is hosted by me. My principal issue is the lack of comments I get some hits and pageviews everyday, but I don’t get comments. How long does it take for something like to form? And at what size does it become when it prevents the passage of stool around it and blocks stool motility altogether? Hi Dr. Mikel….I just saw your comment over at Dr. A.s…..I wanted to ask you if you were on blogtastic? The reason I ask is that I have a blog on blogger that gets quite a few hits a day. In addition I created one at blogtastic that I only use to transfer some of my work from blogger to. I do that in case blogger, with it’s many problems, goes down I will have part of my work saved on another hosting site. I have found, after months, that my blog on blogtastic has not EVER had even one visitor. I don’t promote it in any way but still it seems amazing that not one person has visited it. For some reason I can only imagine that blogtastic is not tied into any of the other hostings and I don’t see a “Next blog” button which is where I initailly got alot of my first time visitors on blogger. That may be one reason why it has been slow for you getting readers. I think your site is great and I think you just have to keep visiting and leaving comments on other blogs. People will find you that way and before long you will become quite popular. but that is something inevitable until the moment. Wow, I really don’t want to become old. Good work though, If I become old, I will need people like you.